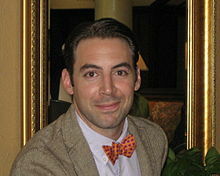 Peter T. Leeson (born July 29, 1979) is the Duncan Black Professor of Economics and Law at George Mason University. Big Think listed him among "Eight of the World's Top Young Economists," and IDEAS/RePEc ranks him among the top 5% of economists in the world. He is a Fellow of the Royal Society of Arts. Leeson is known for extending rational choice theory into unusual domains, such as to the study of bizarre rituals and superstitions, and to the behavior of Caribbean pirates. Steven Levitt has described Leeson's work as "Freakonomics on steroids" and described Leeson as "one of the most creative young economists around." Previously, he held faculty positions at West Virginia University and the University of Chicago. In 1997, Mackinac Center for Public Policy President Lawrence W. Reed read an articulate letter to the editor…that scolded a previous writer for poor economic analysis of a public policy issue. Reed contacted the writer, assuming that he was a professor of some sort. In fact, the author was a 17-year-old Dow High School student, Peter Leeson. As an 18-year old, Leeson was invited by an economics professor at Northwood University to lecture in his course. Leeson earned a B.A. in economics at Hillsdale College in 2001. He received his Ph.D. in economics at George Mason University in 2005 under the direction of Peter Boettke. In 2003-2004, he was a Visiting Fellow in Political Economy and Government at Harvard University. In 2005, he was the F.A. Hayek Fellow at the London School of Economics. Leeson proposed marriage to his now-wife, Ania, in the preface of his book The Invisible Hook: The Hidden Economics of Pirates. Ania also appears as one of the characters in his book WTF?! An Economic Tour of the Weird. Leeson has a tattoo of a supply and demand curve on his right biceps and is an avid cigar smoker. He illustrated his book WTF?! Leeson's Invisible Hook argues that Caribbean pirates developed an early form of constitutional democracy and engaged in behaviors such as flying the Jolly Roger because doing so maximized their profit. In the wake of the Maersk Alabama hijacking, his work on piracy drew substantial media attention. In an article published by National Public Radio, he said that "early 18th century pirates, men like Blackbeard, "Black Bart" Roberts, and "Calico" Jack Rackam, were not only thieves. They were also early experimenters with some of the modern world's most cherished values, such as liberty, democracy, and equality." The idea of the invisible hook is that pirates, though they're criminals, are still driven by their self-interest. So they were driven to build systems of government and social structures that allowed them to better pursue their criminal ends.... The reason that the criminality is driving these structures is because they can't rely on the state to provide those structures for them. So pirates, more than anyone else, needed to figure out some system of law and order to make it possible for them to remain together long enough to be successful at stealing. [T]he case for anarchy derives its strength from empirical evidence, not theory.... Despite... significant arenas of anarchy we do not observe perpetual world war in the absence of global government, shriveling international commerce in the absence of supranational commercial law, or even deteriorating standards of living in Somalia. On the contrary, peace overwhelmingly prevails between the world's countries, international trade is flourishing, and Somali development has improved under statelessness. Leeson has concentrated on the study of the problem of order where no formal law exists, showing how in such diverse situations as trade among strangers, banditry in colonial West Central Africa and modern Somalia, and life in pirate societies over the ages often informal rules emerge that allow order to be preserved without heavy-handed government control. The Economic Role of the State. (ed. with P. Boettke). Cheltenham: Edward Elgar, 2015. Media, Institutional Change, and Economic Development. (with C. Coyne). Cheltenham: Edward Elgar, 2009. ^ Department of Economics, George Mason University. "Peter Leeson Elected as a Fellow of the Royal Society of Arts." ^ Pellien, Jessica. "Peter Leeson Proposes an Economic Love Story." Princeton University Press. March 30, 2009. For further information, see this interview. ^ Leeson, Peter T. WTF?! An Economic Tour of the Weird Stanford University Press. 2017. p. 11. ^ Shermer, Michael. "Pirate Economics? Captain Hook Meets Adam Smith." Scientific American October 1, 2009. ^ Trumbull, Mark and Mark Sappenfield. "Captain freed from pirates in daring rescue." Christian Science Monitor. April 12, 2009. ^ Abraham, Marc. "How pirates of old really did the business." The Guardian. April 6, 2009. ^ Caldwell, Christopher. "No honour among pirates." Financial Times. April 24, 2009. ^ Leeson, Peter T. WTF?! An Economic Tour of the Weird Stanford University Press. 2017. Roberts, Russ (May 25, 2009). "Leeson on Pirates and The Invisible Hook". EconTalk. Library of Economics and Liberty.